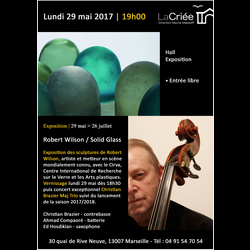 Jazz concert as part of the preview of the "Solid Glass" exhibition by Robert Wilson, organized by the CIRVA. The three musicians invite you to a journey around some of the compositions by double bass player Christian Brazier, selected among his albums entitled: Pérégrinations, Le Temps d'un rêve, Mémoire vive, Circumnavigation... This encounter of Christian Brazier with Ahmad Compaoré and Ed Hosdikian, the two partners of the Oriental Fusion trio, will take you along unknown shores filled with melodic phrases and improvised digressions. Immediate boarding...! Théâtre La Criée, 30 quai de Rive Neuve, 13007 Marseilles.